This paper, just published online in the Nigerian Journal of Clinical Practice, has an important message, albeit buried in the discussion section. Click here or here NigerJClinPract164521-6082483_165344 for the full paper. The authors report 22 consecutive new cases of childhood HIV presenting to Amino Kano Teaching Hospital between June and August 2010. Such a study design was unlikely to achieve its stated aim of determining “the prevalence, clinical features and CD4 counts plus percentage and mortality rate of paediatric HIV in the region” but it inadvertently revealed how the children got infected. The following text appears in the discussion section. “[…] HIV transmission occurred probably via group circumcision in five infected boys (22.7%). Their mothers had tested negative to HIV and none of them had received blood transfusion previously. Three of the five boys had circumcision performed at the same time by a local barber known as ‘Wanzami’ while the other two boys had theirs done in other groups.” Elsewhere one other boy is reported to have been infected by blood transfusion. On the face of it this is earth shattering – a quarter of paediatric HIV transmitted by infected sharps, 23% by circumcision! 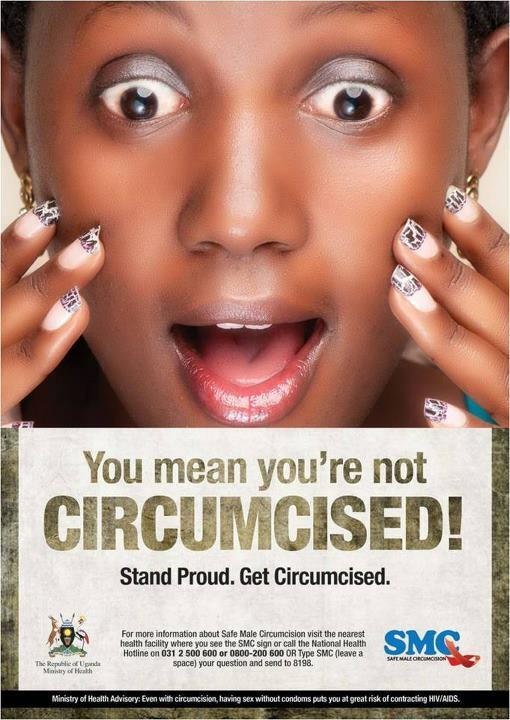 The World Health Organisation (WHO) and most AIDS experts claim to believe that hardly any HIV is transmitted this way, and in many parts of Africa are running campaigns to encourage male circumcision. Here’s one from Uganda. Of course the numbers are small, but apart from the play of chance there is no obvious reason why a hospital-based series should over-estimate the percentage infected by this route. It might under-estimate it, if customers of ‘Wanzami’ were less likely to seek modern medical care. Imagine if this happened in California, or New York. There would be an outcry, and an immediate public health investigation. Such investigations are not difficult. Doctors just need to take a family history and check the HIV status and subtype of the mothers of all newly infected children. Most, as expected, will be infected with the same subtype. But if any mothers are found to be uninfected, or to have a different subtype, their baby was not infected at birth. In those cases the places where the child was immunised, or underwent any other skin breaking procedures need an urgent review of their aseptic techniques, and a check of their books for other children infected at the same time. If they turn out to be transmitting HIV, they need closing down or retraining. According to a recent paper (click here) few if any such investigations have been done in Africa. Let’s hope the organisations presently pushing circumcision in Africa, do them urgently. If it really is an important route for transmission, many lives would be saved. Their campaigns would also need rethinking, but surely WHO, UNAIDS, and the Gates Foundation wouldn’t delay for fear of that happening? Would they?